The midsize SUV is slowly becoming the automotive emblem of America. It is the family car that more and more American families are flocking to. Several models are already being engineered to include alternative-fuel models, and more family-friendly features are being added with every new model year released. The experts have reviewed all the models in this new Red, White & Blue genre, and according to the top dogs at Consumer Reports, Edmunds, Motor Trend, Car and Driver, and J.D. 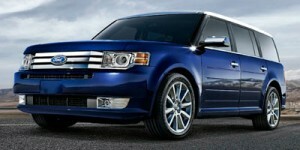 Power & Associates, these are the best midsize SUVs for 2012. The Enclave is one of the safest SUVs on the road, earning a safety score of 9.4 out of 10 in U.S. News’s analysis of the government and IIHS crash test scores. It is also one of the best looking SUVs available, from an exterior standpoint. 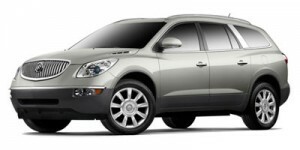 From an interior standpoint, the Enclave provides a wonderful mix of luxury, convenience, and practicality. 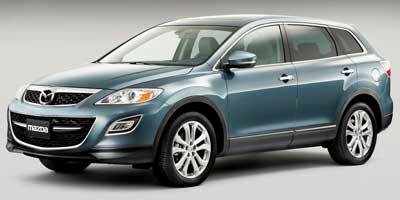 It is also one of the few midsize SUVs that can be equipped as an eight-passenger vehicle. The additional price you’ll pay compared to competitors is well worth the additional comforts and features you’ll receive with the Enclave. 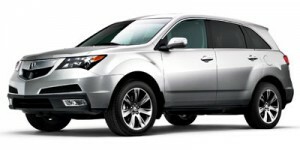 “By combining manageable dimensions with 7-passenger capacity, a comfortable highway ride with responsive in-town handling and car-like construction with respectable off-pavement capability, the MDX has been one of our favorite SUVs since its introduction for the 2001 model year.” The exterior styling of the sloping rear end may put some off, especially rear-seat passengers who must sacrifice head space for the odd style, but the performance and safety standards are both high enough to pay the price for Acura luxury. U.S. News ranks the CX-9 as the Number One affordable SUV available, and for good reason. “Like other large crossovers, the CX-9 is well-equipped, roomy, and comfortable, with seating for seven and good cargo adaptability. But it holds a distinct edge over most in terms of agility and response, important advantages in terms of driver gratification and accident avoidance.” Its handling and performance are second to nearly none in the SUV class. The one area where there is an issue seems to be with reliability. Mazda could help itself by upping its warranty from the standard 3-year/36,000-mile, like many of their Asian competitors have already done. 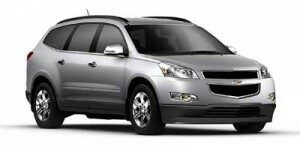 Chevy is making great strides toward becoming the automotive powerhouse they once were, and the Traverse is one of its leading models. A close cousin to the Equinox, the Traverse provides all the comforts and styling that Chevy is known for, with a competitive MSRP. It is a top safety pick from both government crash tests and the IIHS. It also possesses the largest cargo capacity in its class. It does, however, come equipped with some substandard features and low-quality interior materials. When it first emerged, the Flex was a shock to many consumers thanks to its ultra-boxy style. Now that the public has had a chance to become accustomed to the styling, they are now seeing all the other benefits the Flex can provide. Its performance has drivers thinking it has a much bigger engine than actually equipped, but its reliability scores drag it to the bottom of the list. It is, however, the safest SUV available, earning a mark of 9.8 out of 10 in safety from the government and IIHS crash tests.